Bingo Clubhouse launched back in the autumn of 2012, and was one of the first group of sites to launch as part of the 15 Network. The whole network uses software from Jumpman Gaming, not seen anywhere else, offering easy to play, no download, 75-ball and 90-ball bingo, and a selection of mini-games. The homepage is very glittery, gold and purple, and more boudoir than Clubhouse but the graphics are pretty sleek and crisp and it has instant appeal. It’s easy to navigate and so it’s easy to start playing, creating a new account will only take a couple of minutes, and making that first deposit is easy and safe so you’ll be ready to play in no time. 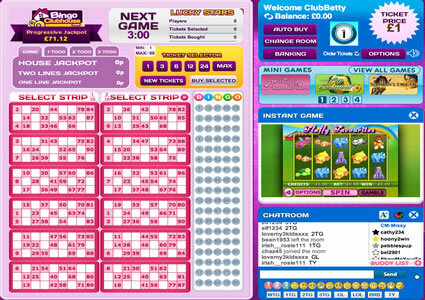 Once you are signed up and ready to play at Bingo Clubhouse, just launch the game screen and you’ll land in the bingo lobby. Again, this is all pretty user friendly and even if you’re a bingo newbie, it’s easy to see what you have to do. From the lobby screen you’ll see all the games available, both 75-ball and 90-ball with specials tabs and pre-buy games too. Each room contains information about the room before you enter, so it’s easy to find out the ticket price for the next game, how busy the room is, and even who the chat host is. Once you choose a room and enter, you’ll see a different, but not unfamiliar interface to many sites on the net. Tickets are clear and easy to see, chat is friendly, and there are chat games hosted throughout the day so you get the chance to win some extra loyalty points as you play too. 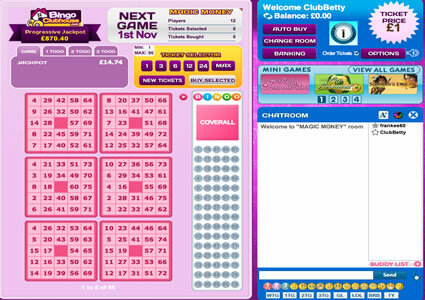 It’s not just bingo either, from the lobby, or from the bingo room you can access a range of other games. When the network first launched, these were limited but there are many available now, including big named jackpot slots, traditional slots, instant wins and casino games too, and just like the bingo, the graphics and game play on these do not disappoint. Promotions feature heavily on this platform, and while they don’t give away the same magnitude of prizes as some bigger named sites, they do have plenty on offer including giveaways and guaranteed jackpots. However, there aren’t many unique promotions at Bingo Clubhouse, so do be aware that when you join in, you’re competing against the network. Overall, Bingo Clubhouse is a bright, appealing site with plenty to offer. The games are exciting, the chat rooms are really friendly and the network is still small enough to call itself cosy. If you’re as much into bingo for the chat and community as you are for the big prizes, you might find yourself at home in the Clubhouse. 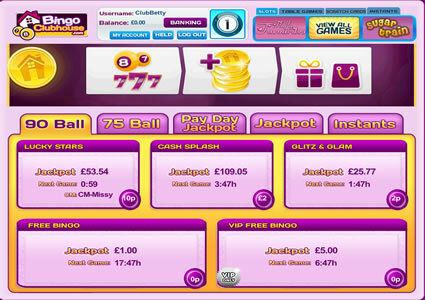 The entire Bingo Clubhouse interface is really user-friendly and easy to play, and there’s plenty on offer for players. The bingo comes in 75-ball and 90-ball but there are lots of options to personalise your bingo experience. From the bingo rooms there are options to auto-daub, or manual daub, turn the caller on or off, and as the platform has great buddy features you can also get alerts when your friends join the room you’re playing in, which is really handy is bingo is a real social experience for you. When you’re playing the mini-games at Bingo Clubhouse you’ll see plenty available, and you can access them while your bingo game is in play if you wish. Look above the chat box from the bingo room and you’ll see exciting games such as the Fluffy Favourites and Sugar Train slots, traditional casino games, scratchcards and plenty of arcade games and instant wins too. Although the promotions at Bingo Clubhouse are networked, there are some great giveaways and regular promotions. Look out for community games like Team Bingo, Lucky Lotto and Weekend Wad, and jackpots such as the Pay Day jackpot giving £1,000 away at the end of each month. The promotions do change from time to time, so do check what is available, but what you are promised from this brand is reload bonuses on every deposit over £10, so even if you don’t win in the giveaways, you can collect a 50% bonus when you make a deposit. 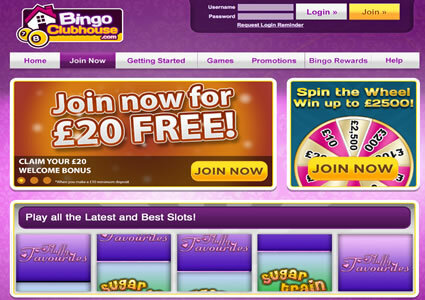 Bingo Clubhouse are all about the community bingo, and as such the site allows you to add your bingo buddies as friends. It’s not quite Facebook but you can then see when your friends enter the chat rooms, and get alerts, making playing with friends, and promotions like Team Bingo easier to join in. The buddies function is really great, and you’ll see the tab on the left when you log in. Just click this and search for your friends and then when they confirm, you’ll get an alert if they join the room you are playing in. Chat Games really are a big part of what Bingo Clubhouse do, and again this all adds to the community appeal of the site. In any hosted room you will usually find a chat game playing, and these usually change every hour. There’s no limit to how many you can win in a day like there is at some other sites, so it’s a great way to grab those little bonuses along the way. Look out for numbers games, games such as buddies and the odd quiz thrown in to keep things interesting at Bingo Clubhouse, and keep you interacting in the chat rooms too.